The title is taken from this verse, the fifth stanza of the Isaac Watts hymn, “Our God, Our Help in Ages Past”, however, the music contains not a quotation nor any other connection to the hymn other than the imagery of these words. 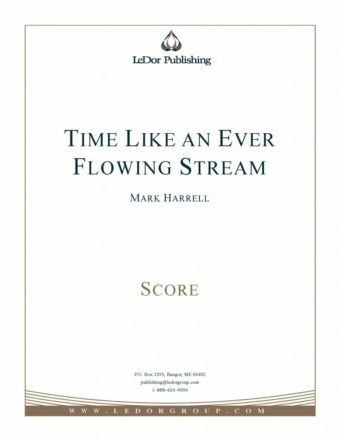 Time Like An Ever Flowing Stream was commissioned by the Knoxville Symphony Orchestra in 2007 and received its premiere in February of 2009 under the baton of Maestro Lucas Richman, to whom it is dedicated. The initial conception of the work began as a celebratory piece presenting various musical ideas that might develop and flow together into a vibrant ‘stream’ of sound. However, with the death of the composer’s father in February of 2008 the chosen stanza brought various other ideas to mind. The horn motif that opens the work, and is the only idea conceived prior to summer of 2008, now stands alone as the individual considering the passing stream that is Life. Bleakness may be present for a time but the ensuing music seeks to refute, in many ways, the fleeting imagery of the Watts poem and to celebrate the memory of those whom we continue to hold in our minds. It is the choice of each individual to hold onto dreams and bright moments that they may not ‘fly forgotten at the opening day’ but grow ever more radiant and continue to bring warmth to our souls.